Bernard Hopkins of Golden Boy says the rematch between Saul Canelo Alvarez and Gennady “GGG” Golovkin will be a “reincarnation of the Andre “SOG” Ward vs. Sergey “Krusher” Kovalev fight. Canelo will be Ward, and Golovkin will be Kovalev, says Hopkins. Hopkins says Canelo (49-1-2, 34 KOs) will learn from the first fight against Golovkin (37-0-1, 33 KOs), and he’ll use what he learned to expose him as not being the “boogeyman” that everyone fears. Canelo didn’t look so great in fighting to a 12-round draw against Golovkin on September 16 in a fight televised on HBO pay-per-view at the T-Mobile Arena in Las Vegas, Nevada. The fans favored Golovkin as the winner unfortunately Canelo and Golden Boy. Canelo was saved by the judges that scored the fight 118-110 for Canelo, 115-113 for GGG and 114-114. The judge that scored it a draw gave Canelo round 7, which was a round where Golovkin fought well. All 3 judges gave Canelo rounds 10, 11 and 12. That was controversial. Canelo may have won 1 or 2 of the rounds, but not all 3. That was something you can second guess and wonder what was going through the minds of the judges when they scored those rounds. The 118-110 score for Canelo stands out well above the 114-114 score, because it suggests the judge didn’t see the same fight that the entire boxing world saw. The judging of the Las Vegas judges was arguably an embarrassment, and it made Canelo look bad. “Yes, it’ll be a reincarnation of Andre Ward and Sergey Kovalev,” said Hopkins to Fighthub in describing what the Canelo vs. Golovkin rematch will be like. “You’ve seen the second fight. Once a guy fights the first time and they fight a second time, in history normally when there’s a rematch, one of those guys got one of those guys’ number. The way that Canelo handled himself and being younger and time will go by, I’m confident that the boogeyman won’t be the boogeyman like everybody is pretending,” said Hopkins. Golovkin doesn’t fight like Kovalev, and Canelo is nothing like Ward, so the comparison by Hopkins is a little off. Ward and Kovalev were about the same height. 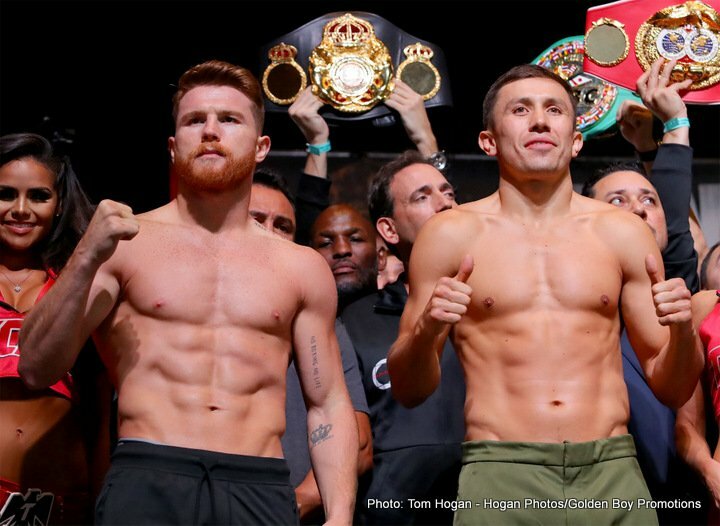 Golovkin, 5’10 ½”, is almost 3 inches taller than the 5’8” Canelo. Ward didn’t have stamina problems from rounds 4 to 12 against Kovalev. Canelo was exhausted after round 3, and he could no longer fight a full 3-minute round after that point. Canelo couldn’t fight more than 1 minute of the 3-minute rounds. That was something hard to miss. Canelo’s conditioning was terrible for the fight. He’d put on too much muscle, and the weight slowed him down. When Canelo would try and come forward to attack Golovkin, the Kazakhstan n fighter would back up and jab him in the face to stop his progress. There was a different in reach that allowed to Golovkin to stop Canelo from attacking him the way he’d done against his past opponents. The combination of Canelo not having the stamina or the height and reach to get to GGG, it forced him to fight with his back against the ropes all night. I don’t think that’s going to change in the rematch. Canelo’s stamina will be the same. He’ll still be 5’8” with a shorter reach than Golovkin unless he has a sudden growth spurt in the next 7 months before they fight again on May 5, 2018. ”I see Canelo coming in strong, coming in super confident, and actually making the second fight so easy,” said Hopkins. “Next year will be a great year for that fight to happen, not 2 years from now, not dragging it out with the fight. It should and it will take place,” said Hopkins.